Today was a first... L-kun's first visit to the Adelaide Oval. No... it wasn't a strange mix-up with the Test Match schedule... we were here for the SACAs (South Australian Cricket Association) Kindy Come and Try Day. This was the first one ever, and a pretty good success at that... not least as it was completely free, and well organised (other than a few teething problems that were quickly overcome). Actually, we only found out a few days ago, as one of L-kuns best friends was going with his father, so we thought, why not. It was going to be a fun day, and his friend slept over as well. Despite some bad weather in Adelaide of late, today was perfect. 28 degrees C, sunny skies... and no wind. There would have been about 100-150 children, plus that and more in terms of parents there. A pretty impressive turn out. Now I have to admit one thing. I'm no longer a super Cricket fan. I don't mind, but I no longer go out of my way to watch cricket. Too many other things to do, and cricket just isn't the same these days from when I was younger. And part of that ambivalence I'm sure comes from my transition to a non-traditional Aussie family, as T-chan would rather drown her head in the toilet bowl than watch cricket (should write this, this close to Australia Day?). Well, that has perhaps worn off on L-kun to some extent. For him, cricket is something you do in the backyard with Daddy... often after some coercion. But today he'd have to get his A game on... he's playing Adelaide Oval. Quite a step up. L-kun practices his psyching-out-stare. Thatta boy! The first thing I realised once we got there (start time of 10:30am... for 2 hours)... was that this wasn't quite the fun "cricket" experience. They were trying to get some serious technique going. First lesson ... throwing. But oddly, they were teaching grip (as if you were bowling, fingers down the seam) as part of the throwing lessons. When I learnt cricket, we were never taught to throw like you bowled... am I out of touch that much? Still, the first lesson was throwing the ball. Listen carefully guys... this is going to be important. And us too parents, as we'd be doing the real coaching here. Stand side on, point with your left hand, throw arm bent with your right (assuming right-handed of course) and then knock the you-know-what out of that cone. L-kun started off slow... trying to work out why he had to throw a particular way. After all, he'd just thrown the ball before hand, which seemed to have got him far enough previously. Next step - bowling. Actually this was somewhat of a revelation for me. I knew L-kun was pretty good at throwing, but hadn't tried teaching him "bowling", i.e. throwing with a straight arm which is rolled in a circular fashion (for those non-Cricket people out there... yes... I hear your pain). For a 4.5 yo that hasn't done it before he got into it very quickly. Ok... he had some funky style issues (like wind-milling his bowling arm initially in the opposite direction), and I'm not entire sure how much straight-arm there really was... but he actually was consistently knocking middle stump over. No joke. I was impressed. Then again, it was a long way from bowling... and believe me, there are some 4 yo that can bowl quite well already! I think if Cricket largely involved bowling, L-kun would be all over it. So after the last session, it was BBQ time. Well, a sausage sizzle to be precise. And L-kun discovered... oh no... green cordial. For the first time. And he loved it. But what he really liked was spending time with his friend. Perhaps recounting their memorable moments out on the field. "Did you see my 10 wicket haul for the innings?" 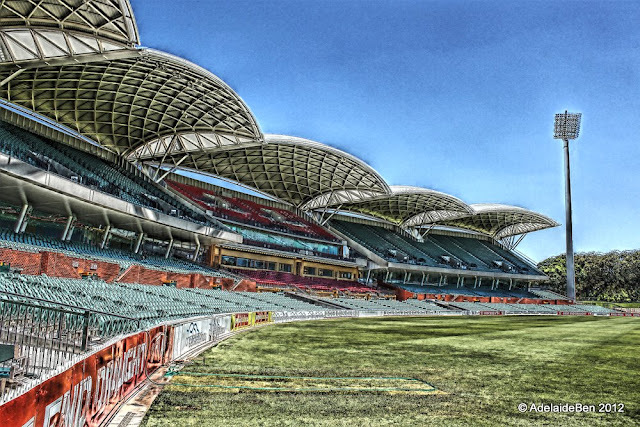 Adeliade Oval remains a glorious venue... though this is about to be converted into a "STADIUM"... coz apparently Adelaide will be a much more attractive and dynamic city then... yet I for one can't really imagine the oval up-sized without losing a lot of it's great charm. Especially when they'll now be playing (Aussie Rules) Football here in the winter months. The end of an era... an era perhaps best symbolised by the fact that they still use the original scoreboard, built in 1911. These sorts of traditions are very "cricket"... and whilst it might be quaint, I guess I like it that way. But one of the other traditions of cricket - modern tradition that is - is the sledge. Using put-downs to gain a psychological advantage over your opponent. L-kun was getting into the spirit with some energetic... "You Mr Potato Pants!"... hold on... who's Mr Potato Pants now? Children at some point, very early on, learn the value of name-calling. They quickly learn the consequence of name calling with parents - but then even more quickly learn that the law's on their side anyhow. If not today... then one day... one day... Mr Potato Pants will triumph. Today however, you win. Anyhow... the day, above anything else was about friendship and children learning to try new things. It was also about Daddy learning that his weekends are about to change forever. Weekend sports is only a short stroll to the pavilion away. Overall, it was a great experience (for Dad as well as L-kun) to be able to play on the Adelaide Oval. The lessons were good, and definitely not just playing around. I think it would have been better to reduce the emphasis slightly on the skill-based component (especially for just a first trial session). Also they tried a half-hearted attempt at introducing a scoring system that range from 100 pts for this, to a million pts to do that. Not a particularly clever idea... at least not the implementation of it. But L-kun enjoyed it anyhow. Still, this was their first attempt to run such a program, and I'm sure they learnt a lot as well from it. I'd definitely recommend bringing your child down when they run it next... hopefully before another 12 months. Very interesting and impressive post. This is my first time I learned about (or actually thought about) cricket in Australia. Reading L-kun's pleasant one-day experience, I felt about a transmission of a tradition from generation to generation. The picture of L-kun and his friend taken from their backs is very good, too. Cricket is definitely in the top 2 sports (along with Aussie Rules Football). It's definitely an Aussie male tradition, both to play, but more importantly to watch. And it's good that L-kun is taking an interest, as it will be more an more important once he hits school. I can't imagine that there's much consideration of cricket at all in Japan?... though I just noted that there is a National Japan Cricket team (currently trying to qualify for the women's World Cup)... and what's more it's not just ex-pat gaijin playing either. I can't imagine it gets much air-time in Japan though. It's a very English sport. Thanks for the comment about the photo... there's a few nice ones that I couldn't put on the blog, but this one wasn't too bad either. I have heard about cricket. I knew it is a British sport, which is also played in India. But this is it; I have never seen a game. Cricket in Australia should be normal, but I have never thought of that (and cricket in Canada, either). Do you play polo, too? For me, Australian sport (and New Zealand, too) means rugby, which is popular to watch also in Japan. It's very much a British sport, but enjoyed all over the Commonwealth countries (England, Australia, South Africa, New Zealand, India, Pakistan, Sri Lanka, West Indies, Bangladesh....). The two odd ones are Canada (which is a Commonwealth country, but don't really play), and Zimbabwe (which plays Cricket reasonably well, but isn't in the Commonwealth). And no... polo is not considered a main-stream sport here in Australia - well not in my social circles at least. It's definitely somewhat of an elite sport. Actually Rugby is very popular in Australia, but especially along the Eastern States. We don't follow it much here in South Australia. Japan is quite good at Rugby too! It's a good game... but I'd prefer soccer. Thanks for that. It is a shame - for the world - that the West Indies have lost so much. When I wrote that I'm no longer a big cricket fan, I used to be when I was younger. And the thing that I most remember was being so excited about Australia v West Indies games. They were some of the most enjoyable games, and some of the biggest characters in Cricket: Viv Richards, Clive Lloyd, Desmond Haynes, Courtney Walsh, Curtly Ambrose, Richie Richardson, Larry Gomes, Michael Holding, Gordon Greenidge... and of course, in the later years, Brian Lara. These are names that still live with me today as true legends of the game. What an amazing team during the late 70s - 80's and early 90's. Cricket lost a lot after the WI fell out of cricket's spotlight.